The Vikings have just $537,402 in salary cap space to start the regular season, according to NFLPA salary data. As the NFL’s regular season kicked off on Thursday night in Philadelphia, the league’s salary cap rules also shifted out of offseason mode. The league’s top-51 rule, which allowed teams to only count their 51 most expensive contracts against the cap for the offseason, is gone for the rest of the league year, meaning every dollar on a team’s books now counts against the cap. That leaves the Vikings with just $537,402 in salary cap space to start the regular season, according to NFLPA salary data, and though the team will be able to make some additional moves to clear more cap space before the new league year, it won’t have a great deal of wiggle room the rest of the season without additional financial maneuvering. The big question, of course, is whether the Vikings will sign one of their pending free agents (Anthony Barr or Sheldon Richardson) to a contract extension in the near future, and doing a deal with Barr could actually free up some cap space for the rest of the season, given the fact Barr is playing on a $12.3 million guaranteed option for the rest of the year. If the Vikings were to sign Barr to a deal similar to the five-year, $50 million extension they gave Eric Kendricks this spring, they could conceivably convert Barr’s $12.3 million cash figure to a $1.8 million base salary and the same signing bonus ($10.5 million) they gave Kendricks in April. That would drop Barr’s cap hit this season to $3.9 million, clearing $8.4 million off the books that the Vikings could carry into next season. The Vikings could save another $5.5 million next year by declining safety Andrew Sendejo’s 2019 option, and another restructure or two would allow them to fit a Barr deal onto their books while providing room for additional business in 2019. 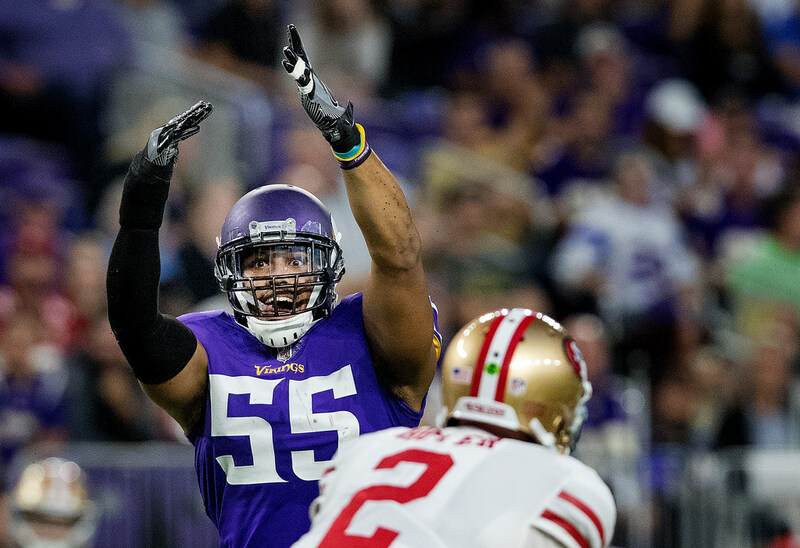 The decision facing the Vikings, though, would be whether they would do a deal like that now or let things play out, particularly given how important Richardson could become to their defense and lingering questions about Barr’s impact as a pass rusher. Another financial topic of interest: the Vikings will have to part with a healthy sum of cash come March 15. That’s when they’ll pay portions of signing bonuses to Danielle Hunter ($6.5 million), Stefon Diggs ($6.5 million), Xavier Rhodes ($4.5 million), Kendricks ($3.5 million), Mike Hughes ($1,314,088) and Brian O’Neill ($225,000). That’s a cash outlay of more than $22.5 million, independent of anything else the Vikings would do in free agency between now and then. The Vikings’ upcoming decisions should continue to be a source of intrigue, in large part because they won’t be simple. A team that has built its roster around the idea of keeping its core draft picks is largely subsisting without much of a middle class, so to speak. That means the Vikings need their big-money players to produce, their affordable talent to contribute and their difficult choices to work out.